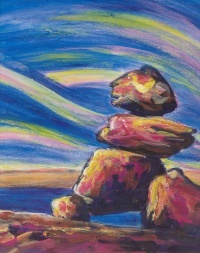 CM Magazine:Inuksuk Journey: An Artist at the Top of the World. 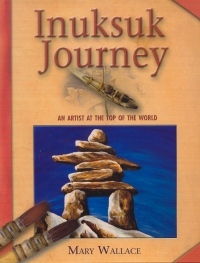 Inuksuk Journey: An Artist at the Top of the World. Toronto, ON: Maple Tree Press, 2008. Wallace, Mary, 1950- -Travel-Canada, Northern-Juvenile literature. Canada, Northern-Description and travel-Juvenile literature. It must be morning. Bright sunlight filters through our tent roof. Even though it never got dark last night, we slept soundly, lulled by the crashing of ocean waves from our camp's shore. I step our of our tent and spot Timmun at the water's edge. He casts, and pulls in a silvery flash from the ocean. Nearby, at the mouth of a giant river, stands the inuksuk that marks a good place to fish. Without a doubt, Mary Wallace has a profound interest and respect for life in the Arctic. Chronicling her summer trip to Nunavut in scrapbook-fashion, her delightful journaling captures the feeling and allure of the north. Her incredible acrylic depictions of various inuksuk, the landscape, and the fauna pay homage to this region of the world that so few of us ever have the opportunity to see. Photographs taken by Mary and her sister, with whom she traveled, provide a careful narrative of their week-long camping exploration. Each two page entry is separated by Wallace's artistic interpretations of her trip which exemplify her abilities as a painter. The inuksuk provide the central theme for Wallace's journey as their reassuring presence, seen all over the traditional territories of the Inuit, constitute the cultural landmarks that Wallace uses to express her unique summer experience. Inuksuk Journey is carefully crafted and beautifully told. The artwork enables this book to stand alone as an aesthetic piece that can be appreciated by older children and adults. Adding to its value, this work can also be a fantastic resource for those who wish to understand aspects of life in the north as seen through the eyes of a non-native. This is a must-have for Canadiana, fine art and native studies collections and is highly recommended for most other non-fiction collections for children. Christina Neigel is the Program Head for the Library and Information Technology Program at the University of the Fraser Valley, Abbotsford, BC.